One cylinder and worlds apart from the line of historical German three liters shown in this 1984 Mercedes Benz commercial, after 27 years the claims of the 300D's contribution to Mercedes Benz's dynasty seem a lot less of a stretch. What do a 50s era Mercedes 300S, 300SL and 300SLR have in common with a 1984 Mercedes 300D? Aside from the 300 in their name, denoting the cars produce three liters of engine displacement, not too much. Looking at the three beautiful Mercedes of the 50s, automobiles on the cutting edge of automotive luxury, sporting and racing respectively, it must have been hard to believe in 1984 that the 300D would have anything to contribute to the Mercedes legacy of 3.0. 27 years later, it's clear the car does. Looks and performance wise, the 5 cylinder 300D didn't have a lot to offer in comparison to the vehicles that came before it. Although the 300D was a handsome car, it can't compare to the styling of the company it keeps in this advertisement. I've never driven a three liter Mercedes from the 50s, but I have spent enough time behind the wheel of a 300D to know the 300SL and 300SLR would not have earned their legendary sports car status without being able to outperform the 300D in almost every way. With this is mind, it might be hard to pick out what these quirky 5 cylinder diesel sedans would have to contribute to the three liter legacy. Mercedes claims that the 300D is "so far beyond the ordinary that it outperforms every other diesel in America if not the world". Again deferring to previous 300D ownership, 27 years later I think this statement is true. It is hard to imagine there are more of any other diesels of that age still on the road in America, if not the world. 300Ds are some the most bulletproof cars ever made, still providing reliable service to owners all over the world. 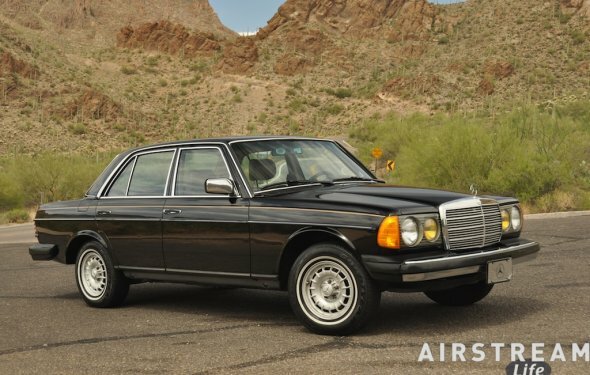 While it isn't quite as interesting as timeless beauty, famous performance or notable race heritage, the 300D and Mercedes Benz made good on their contribution to the three liter dynasty.